I’ve been meaning to do this for quite a while, so finally here I am! Tia over at The Adventures of Christopher and Tia does Flashback Friday every week and I always love seeing hers and reading her posts! This week I decided to get in on the flashback fun! This week the theme is school portraits! I was so happy when mom brought this photo to me! It is my favorite of 13 years (kindergarten-senior year) of school portraits! I remember this day very well! At that time, first grade, kids from kindergarten through second grade had to take a bus to our little grade school north of town. 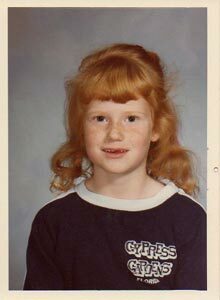 That morning when my Mom got me to the bus, we remembered it was picture day! Luckily Mom had time to run back home and grab my order forms for pictures, but not time to make me change clothes and do my hair. I Love this photo! Why? Yes, I have on an old sweatshirt (from somewhere I’ve never been) and my hair looks like I probably did it myself that day…but, it looks like me! I remembered being so comfortable with how I looked and felt getting my picture taken that year. Other kids in the line were messing with collars and combing their hair, while I just stood there…happy.